Show assignments have been sent out. 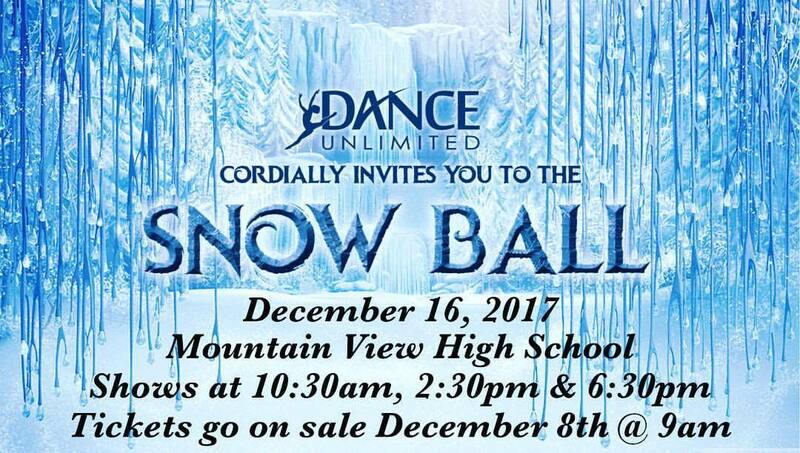 Dress rehearsal schedules and exact show orders will be released December 1st. It's time for the BDTA Fall Dance Workshop! Dance Unlimited is a member of the Boise Dance Teacher's Association. BDTA is a non-profit organization that provides student workshops, teacher education and promotes dance in our area. We host a workshop each fall and bring professional choreographers/instructors to the Treasure Valley to work with member studio's dancers! Complimentary Trial Classes THIS WEEK! Browse the classes listed and pop in to as many as you'd like! All you have to do is stop by and check in at the desk to take advantage. Read more about Complimentary Trial Classes THIS WEEK! Unfortunately, we are going to have to cancel today's class with Hailee Payne and reschedule it for a later date. She just reached out to tell us that she was presented with an amazing opportunity to work as an assistant for very well known choreographer and understandably, could not pass it up. We are in talks with her now, working on an alternate date for her to come back and work with all of you. A new date will be sent out as soon as we confirm with her. We are so excited to announce our new Saturday Sessions at Dance Unlimited! Saturday Sessions are fun, mini camps for ages 3-8. Dancers will have a blast learning a dance, playing games, making crafts and then performing for their families! These camps offer the opportunity to mix-and-match, with different themes throughout the year, always held on the third Saturday of every month from 5:30-7 p.m. Parents, it's the perfect opportunity for a guaranteed date night every month! Read more about Saturday Sessions at DU! Please find our choreography schedule for the 2017-2018 season. Please add all dates/times to your schedule. If you cannot attend choreography due to an already planned vacation or school, we understand. However, we ask that you find someone from another team that can fill in for you during choreography times. If this applies to you, please let your respective coach know of your planned absence and who you have filling in your spot.